Custom Building Products #09 Natural Gray Fusion PRO - 1 Gal. Custom Building Products #09 Natural Gray Fusion Pro Single Component Grout is a single component grout with the stain resistance and colour consistency of epoxy grouts, but with the workability of cement grouts. Fusion Pro is ready to use on all tiles including glass tiles and polished natural stone, for exterior and interior wall and floor use. Fusion Pro is a high performance, advanced patent pending formulation that features built-in Microban antimicrobial product protection to inhibit the growth of stain causing mould and mildew on dried grout. Custom Building Products #145 Light Smoke Fusion PRO - 1 Gal. Custom Building Products #145 Light Smoke Fusion Pro Single Component Grout is a single component grout with the stain resistance and colour consistency of epoxy grouts, but with the workability of cement grouts. Fusion Pro is ready to use on all tiles including glass tiles and polished natural stone, for exterior and interior wall and floor use. Fusion Pro is a high performance, advanced patent pending formulation that features built-in Microban antimicrobial product protection to inhibit the growth of stain causing mould and mildew on dried grout. Custom Building Products #165 Delorean Gray Fusion PRO - 1 Gal. Custom Building Products #165 Delorean Gray Fusion Pro Single Component Grout is a single component grout with the stain resistance and colour consistency of epoxy grouts, but with the workability of cement grouts. Fusion Pro is ready to use on all tiles including glass tiles and polished natural stone, for exterior and interior wall and floor use. Fusion Pro is a high performance, advanced patent pending formulation that features built-in Microban antimicrobial product protection to inhibit the growth of stain causing mould and mildew on dried grout. 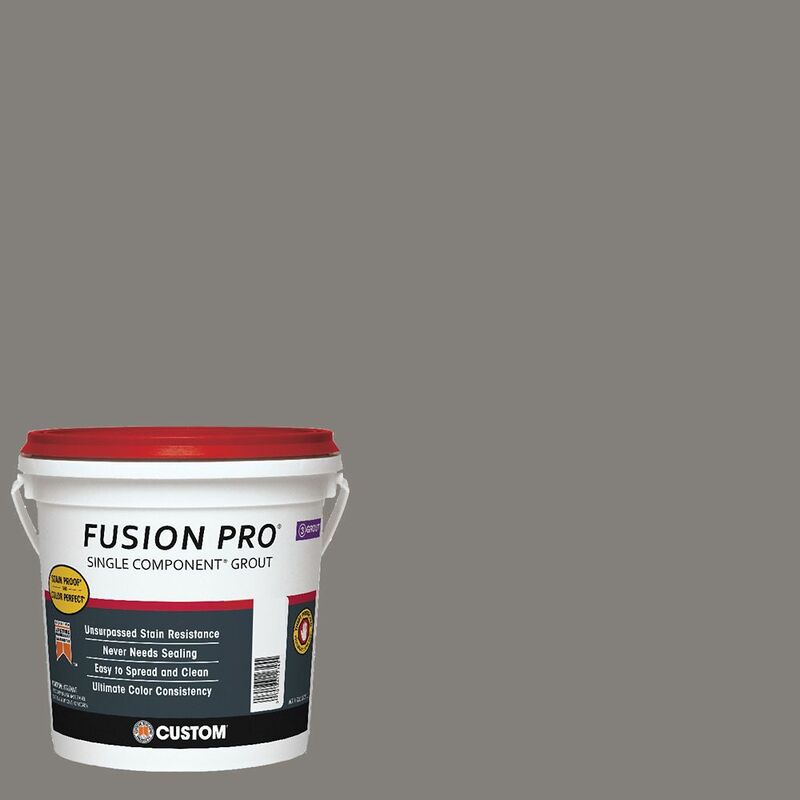 #335 Winter Gray Fusion Pro 1Gal Custom Building Products Fusion Pro Single Component Grout is a professional grade, single component sanded grout. Fusion Pro requires no mixing and is ready to use on ceramic, porcelain, glass tiles and polished natural stone. It is suitable for exterior and interior wall and floor use.